Emily Arnold McCully's hugely enjoyable biography of Ada Byron Lovelace reveals how she overcame 19th-century societal norms and a highly dysfunctional family to set the information age in motion. Two centuries before computers became ubiquitous, a brilliant young British woman named Ada Lovelace imagined an "engine" that could process information much like today's computers do. 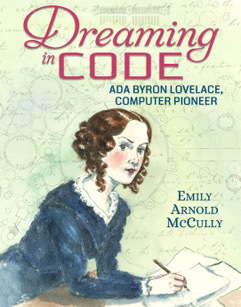 The life of this forward-thinking scientist is brought to light for young readers in Emily Arnold McCully's fascinating biography Dreaming in Code. Dreaming in Code progresses chronologically from Lovelace's birth in late 1815 (to a domineering mother and poet Lord Byron, the "titled, handsome, reckless, and irresistible" father whom she never knew) to her painful death from cancer in 1852. Although her controlling mother stinted on emotional nurturing, she did give Lovelace a far more rigorous education than most girls of her time were allowed. As a young adult, Lovelace cultivated mentors, one of whom was Charles Babbage, a quirky inventor, scientist and mathematician whom she met when she was 17 and he was 41. During their two-decades-long collaborative friendship, Babbage was developing and modifying engines designed to replace mental labor. Lovelace understood the workings of these machines in a way no one else did, even Babbage himself. McCully is the Caldecott Medal-winning author/illustrator of Mirette on the High Wire as well as dozens of other children's books, such as Clara. Dreaming in Code is written with grace and intelligence, researched with care and peppered with historic photos and remarkable illustrations of 19th-century technology. It's sure to inspire a new generation of pioneers unwilling to let obstacles distract them from leading the way into the future. --Emilie Coulter, freelance writer and editor Discover: This hugely enjoyable YA biography of Ada Byron Lovelace shows how she overcame 19th-century societal norms and a dysfunctional family to set the information age in motion.